In the opening group of five songs—the vocal suite Recollection Opus 71 (Shelley's To Jane: The Recollection)—Anton Arensky (1861-1906) turned to the translation of Shelley's complete works by Konstantin Bal’mont, the poet best known outside Russia for his translation of Edgar Allan Poe's The Bells, which Rachmaninov used for his choral symphony, Op 35. Although barely completing his school education, Bal’mont became a polyglot of quite incredible attainment, having, according to some sources, forty foreign languages, according to others, sixteen. His great love was English poetry and Shelley in particular, and it was his translations of Shelley\ work between 1892 and 1899 that brought him to the Russian public's attention. It is thus poetry of the Romantic era perceived through Fin de siècle sensibility which made the work of this poet so attractive to composers of the period. Arensky, having studied at the St Petersburg Conservatory, became Professor of harmony and counterpoint at the Moscow Conservatory, among his pupils being Sergei Rachmaninov. The composer of more than seventy songs and duets, Arensky understood the fashionable taste of his lime, particularly the melancholy of the salon, and the critics of the period saw him as 'off shoot' of Tchaikovsky. His understanding of the piano and feeling for the voice combined to produce masterpieces of Russian art song. 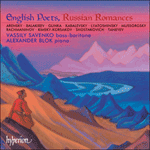 The Opus 71 suite, circa 1905, displays Arensky's easily flowing, always melodious music which conveys perfectly the dream-like atmosphere of regret and longing for past happiness. The writing is very atmospheric and depicts a world of nature, in which forest, sky and water express the pain and joy of love. Up - to thy wonted work! A frown ison the heaven's brow. Thal skirts the ocean's foam. Drug s drugom sosny obnyalis'. Kak ch' ye to lepetan' ye. Bez gryoz i bez dvizhen'ya. Ni vzdokh. ni svuk pokoya ne smushchayet. I les ob'yaty sladkim snom. Chto v etom mire tyi byla.